Public engagement in research takes many forms. 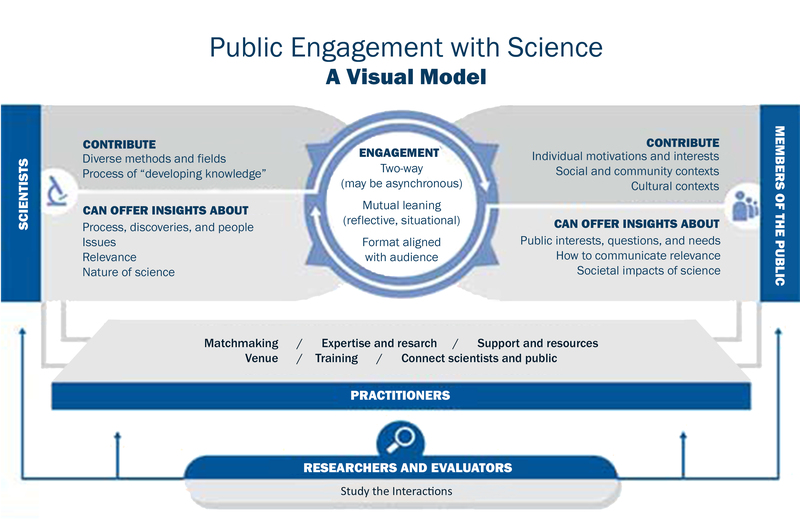 The American Association for the Advancement of Science (AAAS) describes public engagement as “intentional, meaningful interactions that provide opportunities for mutual learning between scientists and members of the public.” As visually depicted in Figure 1, engagement can be the participation of citizens in the research itself, the facilitation of interactions between scientists and the public through public forums or community organization programs/events, or the dissemination of information regarding your research and/or creative activity through communication channels. Federal agencies express interest in research and creative activity that promotes meaningful public engagement. For example, the National Science Foundation (NSF) explicitly requires projects to incorporate broader impacts (Narrative Issue: Communicating Broader Impacts), and the National Institutes of Health (NIH) regularly engages in a range of outreach efforts as well as requests public input on projects. Direct engagement with the public. “Citizen-science" opportunities (also known as "community-based science," or "public science") offer a range of participatory activities to the general public. This kind of engagement may involve collecting data, conducting analysis, or participating in the research itself. For example, the National Geographic Society promotes ongoing citizen science opportunities. Should your research plan include a participatory component, be sure to develop a framework for evaluation. Dr. Tina Phillips, et al. explore learning outcomes and methods for evaluation in their article on measuring outcomes in citizen science. Here at IU, OVPR’s Center for Evaluation, Policy and Research (CEPR) can help with measuring the impact of your efforts. Communicating your research through publication and dissemination. Tip! Be sure you have all the appropriate permissions and releases (i.e., photo releases) before disseminating. Need some ideas? The NIH website houses a handy checklist for communicating health science research to the public; these tips translate to a variety of fields, not just health science. You can also browse tagged content on social media (#scicomm, #researchcomm, #citizenscience) for some inspiration. Refer to the VPR online Quick guide: Communicating about your work to easily locate a number of internal and external dissemination resources. “Talking about your work to non-experts” is an interactive, informative workshop offering skills, tools, and resources to help you expand your communication about your work. This free opportunity is slated for Friday, May 17, 2019 from 8:30 am – 3:00 pm and is offered by the IU Office of the Vice President for Research, IU Communications, and other partners. Federal agencies and public engagement. NIH “Clear Communication” Initiative: provides perspectives, tools, and resources to improve the quality and usefulness of information about science and health for the public.